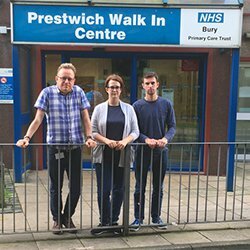 Bury’s NHS Clinical Commissioning Group is now formally consulting the public on the closure of Prestwich and Bury Walk-In Centres. The Governing Body of NHS Bury CCG have agreed a ‘redesign of urgent care services’, which includes closing the Walk-In Centres at its last meeting – following the initial public consultation. Members of the public will be able to give their views until Monday 20 March 2017. Please do let us know your views (comment on this post, or ‘cc’ us into your email to the CCG as we have a meeting coming up with the CCG about the closures, and will also be making our own submission to the CCG, based on public opinion.